COATINGSPRO ROOF COATINGS 2016 9 thermoplastic polyolefin (TPO), poly vinyl chloride (PVC), aged asphalt, fiberglass, ethylene propylene diene terpolymer membrane (EPDM), and hypalon are among the substrates that can receive coating and/or SPF systems. In add ition, many d if ferent t y pes of coatings can be applied over SPF on roof tops. "A n SPF insu lated roof prov ides a unifor m, pred ictable sur face unlike other substrates, such as concrete. SPF prov ides a g reat substrate for a coating w ith respect to ad hesion and porosit y," ex plained Steven Reinstadt ler of Covestro. It must be remembered that each substrate is unique and shou ld be treated accord ingly when it comes to sur face preparation, repair, and chosen coating mater ia l. Many coatings manufacturers of fer roof coating and SPF options that are eng ineered specif ica l ly for cer tain roof deck substrates. Repair and Prep W hen a coatings contractor arrives on the scene at a roofing job, he or she must take stock not only of the acces- sibility and safety issues, but also of the condition of the existing roof. As Edward Leshansky of Tropical Coatings pointed out, "Not ever y aged roof is a candidate for a resto - ration coating system. Existing leaks and other problems must be diagnosed and repaired prior to the restoration coating system application. 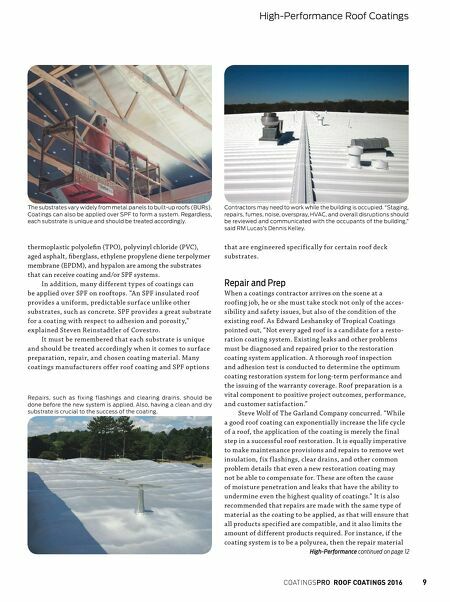 A thorough roof inspection and adhesion test is conducted to determine the optimum coating restoration system for long-term performance and the issuing of the warranty coverage. Roof preparation is a vital component to positive project outcomes, performance, and customer satisfaction." Steve Wolf of T he Garland Company concurred. " W hile a good roof coating can exponentially increase the life cycle of a roof, the application of the coating is merely the final step in a successful roof restoration. It is equally imperative to make maintenance provisions and repairs to remove wet insulation, fi x f lashings, clear drains, and other common problem details that even a new restoration coating may not be able to compensate for. T hese are often the cause of moisture penetration and leaks that have the ability to undermine even the highest quality of coatings." It is also recommended that repairs are made w ith the same ty pe of material as the coating to be applied, as that w ill ensure that all products specified are compatible, and it also limits the amount of different products required. 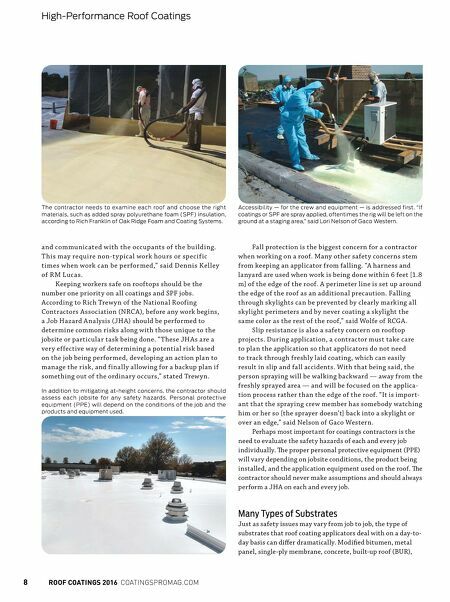 For instance, if the coating system is to be a poly urea, then the repair material High-Performance continued on page 12 High-Performance Roof Coatings The substrates vary widely from metal panels to built-up roofs (BURs). Coatings can also be applied over SPF to form a system. Regardless, each substrate is unique and should be treated accordingly. Contractors may need to work while the building is occupied. "Staging, repairs, fumes, noise, overspray, HVAC, and overall disruptions should be reviewed and communicated with the occupants of the building," said RM Lucas's Dennis Kelley. Repairs, such as fixing flashings and clearing drains, should be done before the new system is applied. Also, having a clean and dry substrate is crucial to the success of the coating.